The sound the bathroom scale made as I stepped gingerly on to it the other morning could have been a groan or it could have been a low chuckle. It’s even possible it was a knowing sigh. The only thing that I know for certain was it didn’t sound surprised. And, as I stared down at the little indicator arrow quivering with the strain, I had an inkling where some of the five pounds of butter I bought just before Christmas had ended up. The holidays are officially over and it’s high time for something without gravy. 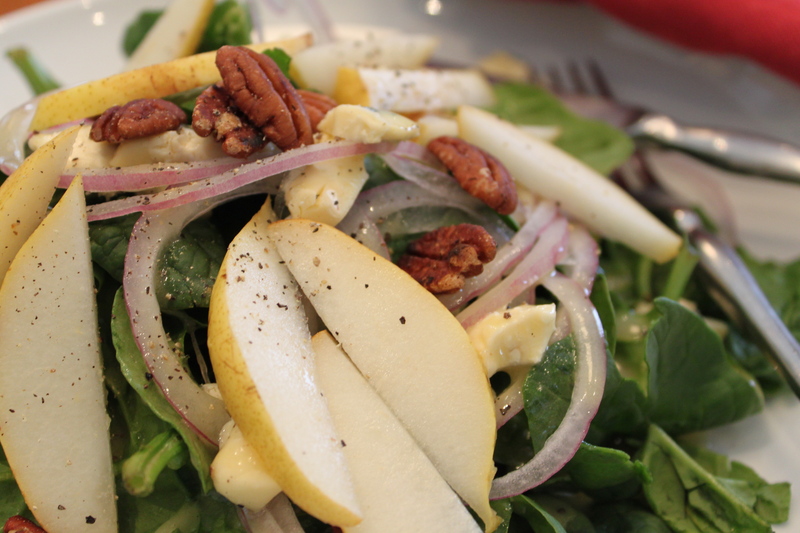 This simple salad was our first of the season and it was a great-tasting start to the New Year, even if it was a few days overdue. I wouldn’t say this is the lightest salad I’ve ever made, given it has nuts and cheese, but it was substantial enough for a dinner while green enough to be considered resolution compliant. The sweetness of toasted pecans compliments the bitter edge of the spinach (walnuts are also good) and pears and blue cheese always work well together. I used gorgonzola but any decent blue cheese would do. Assemble the salad in the order you like best, shake the dressing ingredients together and pour it on. Season with a little pepper (I find the Dijon has enough salt for me). Your bathroom scale will miss you. Nice salad photo. Take more.